How Long Does it Take to Transfer Points for the Companion Pass? I wrote earlier that an easy way to get the remaining 6,000 Southwest points needed for the Companion Pass is to transfer points from Choice, Marriott or Hyatt to Southwest or to buy flowers. If you apply for 2 Southwest credit cards and spend $2,000 on each of them and the points post to your account in 2013, you will have earned 104,000 points out of the 110,000 points needed for the Southwest Companion Pass. That’s 100,000 points from 2 credit card sign-up bonuses & 2,000 points on each card by meeting the minimum spending requirements. So you need an extra 6,000 Companion Pass qualifying points to earn the Companion Pass. Of course, you can spend $6,000 on your credit cards, but there are easier and cheaper ways such as transferring hotel points to Southwest, buying flowers or items from the online shopping mall, participating in their dining program etc. The cheapest way is to buy 18,000 Choice hotel points for $198 and transfer them to 5,400 Southwest points. 5,400 Southwest points are worth ~$90, so your net cost is $108. 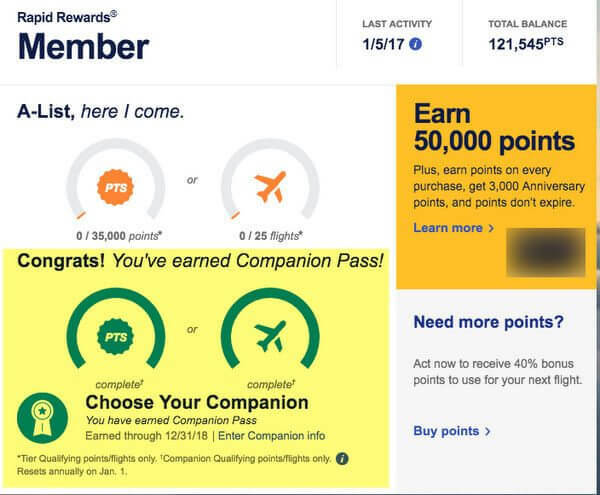 Here’s a post on 10 different ways to earn Companion Qualifying points on Southwest. How Long to Transfer Points? I was curious to see how long it would take for hotel points to transfer to my Southwest account and if they would count towards the Companion Pass. Note that these are MY results, and your result could be completely different. 1. Choice Hotels. I bought Choice hotel points on November 18, 2012, but they posted to my Choice hotel account on November 21, 2012. As a test, I transferred 6,000 Choice points to 1,800 Southwest points online. The points posted to my Southwest account on November 29, 2012 (11 days) and they counted towards the Companion Pass. You can transfer points from American Express Membership Rewards to Choice if you’d rather not buy points. 2. Hyatt Hotels. As a test, I transferred 5,000 Hyatt points to 2,400 Southwest points online on November 18, 2012. The points posted to my Southwest account on November 19, 2012 (1 day) and they counted towards the Companion Pass. You can transfer points from the Chase Ink Bold, Chase Ink Plus, and Sapphire Preferred to Hyatt if you’d rather not buy points. 3. Marriott Hotels. As a test, I transferred 10,000 Marriott points to 2,000 Southwest points online on November 18, 2012. The points posted to my Southwest account on November 21, 2012 (3 days) and they counted towards the Companion Pass. You can transfer points from the Chase Ink Bold, Chase Ink Plus, and Sapphire Preferred to Marriott if you’d rather not buy points. 4. Teleflora Flowers. Emily was feeling blue, so this was the perfect time to see how long it took for a flower purchase from Teleflora to post to my Southwest account! Teleflora offers 1,000 Southwest points for buying flowers. So you could buy flowers for $45 per 1,000 Southwest points (~$30 for the flowers + $15 delivery charge). I ordered flowers on November 29, 2012 with same day delivery to Emily. The flowers arrived on time, and the points posted to my Southwest account on December 5, 2012 (7 days). I’m not sure if I earned brownie points like Points Envy (but I did earn Companion Pass Qualifying points! ), because Emily asked me how many points I got for the flowers. 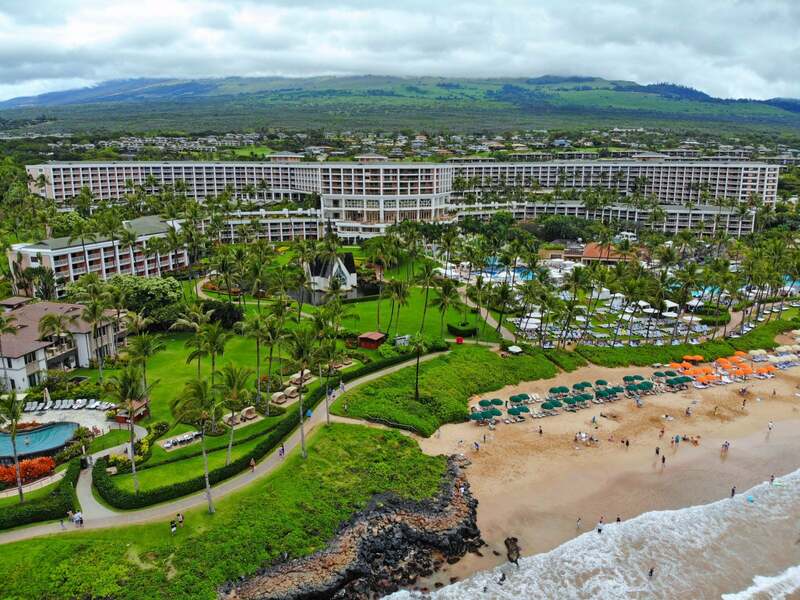 In my experience, points from Choice hotels, Hyatt, Marriott & Teleflora still count towards the Southwest Companion Pass Pass and may take anywhere from 1 to 11 days to post to your Southwest account. But this was my experience, and your experience could be different! PS: I’m traveling so I won’t be able to get to the comments and email for today! I need 15,000 SW Rewards points to get to the 110k required for companion pass. I was thinking about buying thru the RR portal for the 1800 flowers. It says it takes 6-8 weeks to post. If that is the case, it will be too late. Please advise the best option to get the 15k and posted asap! I need to transfer Marriott points from my account to my wife’s rapid rewards account. Will it be a problem since the accounts are not in the same name? Is there a way around this? @Kevin – You could try, but usually the names need to match. Any idea how far in advance the companion pass needs to be added? I’m waiting on my choice points to transfer since last Thursday. This will put me over the 110,000. My trip is for may 2nd. I would like to get my pass by then so I can cancel one of the tickets and add it back as companion. Should I just wait on the choice points or is there another way? @Andrew – You can add a companion as long as Southwest is selling tickets (any types of tickets). It should take ~10 days to transfer. Can I get the Marriott card offering a 50,000 point bonus and then transfer those into my southwest account to have the miles needed for the companion pass? I thought I had heard that there is an issue with having too many chase cards. I already have 1 personal and 1 business chase card from Southwest. Thanks!!!!!!!! @Devon – Purchased points don’t count. @Lisa – You should be able to book your companion a few days after you earn the necessarily points. But you can always book your travel now (and lock in a lower fare). @Amy – There is a link to a 70K version in the Hotel Credit Card tab. 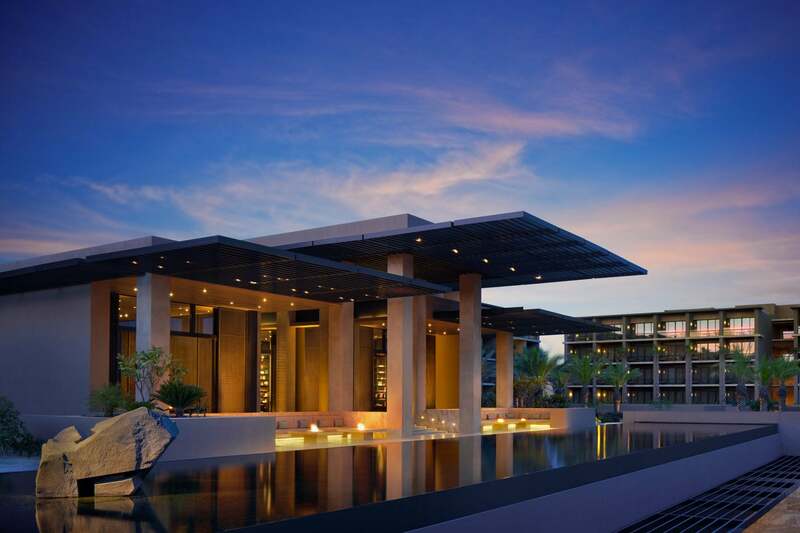 You could transfer points from Marriott, but if you already have the Southwest business and personal card, you should already have 100K of the 110K points needed and may not need to apply for the Marriott card. That said, I’d wait 3 months from your last Chase applications if you got 2 cards the last time. First of all, thank you so much for your blog posts, they have been super helpful! I’m 2,546 away from earning my companion pass, and rather than purchase points, I am planning on just using my regular spending each month on my SW Chase cards. My bill will post on the 17th of April, and I have ensured that my bill will be enough to cover the 2,546. At that point, when will I be able to book travel using the companion pass? I need to book tickets for the 11th of May and hoped I’d be able to use my companion pass benefits at this point. Just wondering what the turn around time is once you earn the points to the time you’re able to use the pass. Thanks!